Ever stood slack-jawed on a street corner with a friend trying to figure out where to go to throw back a beer? Or debated whether it'd be better to hop on that approaching bus or descend into the subway to catch a train? The latest nifty gadget from the hardware and software engineers at Breakfast offers a slick solution to those problems, and others. 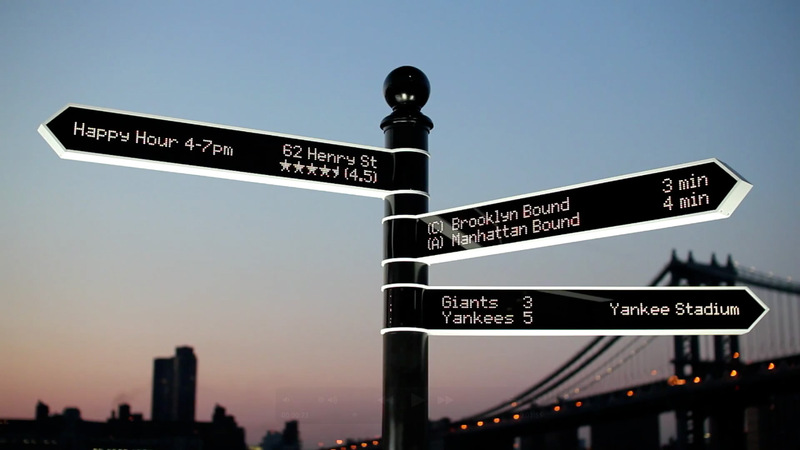 Called "Points," it's a rotating digital street sign built to display a flexible range of data, from which favorably reviewed restaurants are within walking distance to nearby tweets. And it comes with an at-hand, interactive menu of options that can be programmed to change based on the time of day (are you hungry for breakfast or dinner?) or the needs of a particular setting (sports scores at a stadium). Feats of technology and design aside, at least some of the info is already accessible to people with smartphones in their pockets. It's easy, though, to imagine the value of aggregating and conveniently serving up certain cues in the context of their environments—especially at big, often chaotic events like music festivals, where signs could literally and dynamically direct attendees toward the overlapping acts going up on different stages. Unlike some of Breakfast's other projects, "Points" wasn't created for a particular brand client, but the agency sees myriad ways to customize the interface for marketers, including, naturally, at sponsored events and locations. That not to mention the obvious public-service and tourism applications for municipal governments. So, what say all you brand jockeys out there—on point, or pointless?